Although one of Howard University’s more esteemed former students, Ta-Nehisi Coates, said he was happy that James Comey was going to be speaking to the HU community this year, some students at the 2017 opening convocation keynote address didn’t feel the same. They then began a call and response, chanting slogans like, “I said I love being black” (repeat), “I love the color of my skin” (repeat), “This is the skin that I’m in” (repeat). Shortly thereafter, the livestream of the event was cut on WHUR. Comey was appointed head of the FBI during the Obama administration and was fired by President Donald Trump in May. Comey was seen as very much pro-police when he was top cop, including his supportive stance on the so-called Ferguson effect, which is the theory that violent-crime rates in the U.S. were on the rise because police were being more heavily scrutinized in light of protests against police brutality. 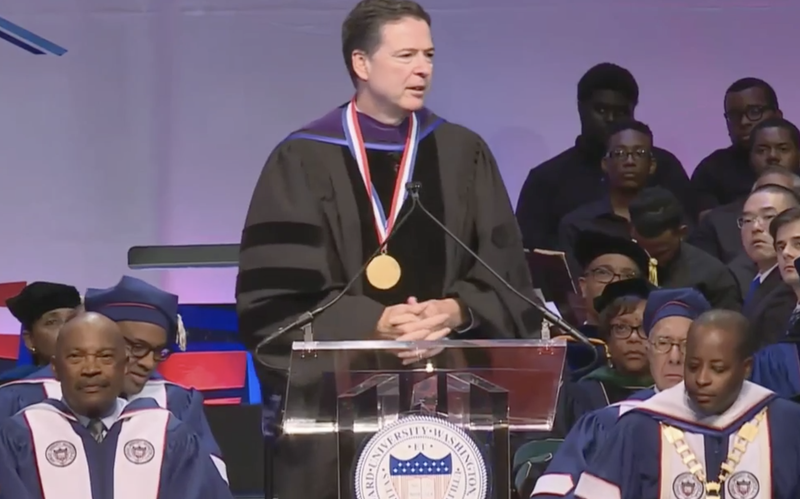 In August, Howard announced that it was naming Comey the 2017-2018 Gwendolyn S. and Colbert I. King endowed chair in public policy and that he would speak at this year’s convocation, formally welcoming the Class of 2021. One current student, Naomi Adams, told The Root that the auditorium was mostly cleared out, and the protest continued outside with libations being poured for those African-American victims of police brutality. It is unclear whether or not Comey was able to finish his speech.